6" ID flexible duct hose for oil mist and chemical fume applications. 8" ID flexible duct hose for oil mist and chemical fume applications. 12" ID flexible duct hose for oil mist and chemical fume applications. 6" round duct flange collar, with adhesive gasket on flange and rubber seal on collar. 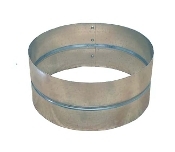 8" round duct flange collar, with adhesive gasket on flange and rubber seal on collar. 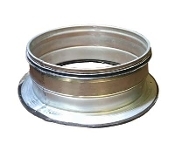 12" round duct flange collar, with adhesive gasket on flange and rubber seal on collar. 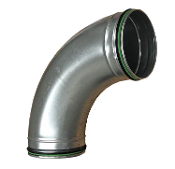 6" Leakproof Elbow, male ends, rubber seals, galvanized steel. 8" Leakproof Elbow, male ends, rubber seals, galvanized steel. 12" Leakproof Elbow, male ends, rubber seals, galvanized steel. Hose clamp for flex duct hose. Select 6", 8", or 12" dia options. Female duct connector. Select 6", 8", or 12" ID options.